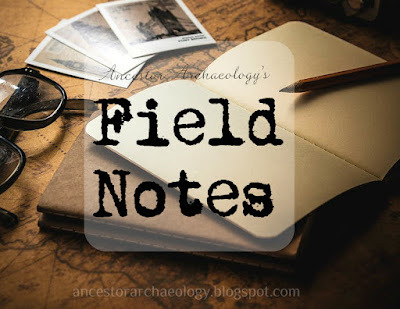 Ancestor Archaeology: Field Notes: What's In A Name? I was named for my father's grandmother. Or so the story goes. My brother got a combination of our mother's surname and our father's first name. Names are important. Names have meaning. I'm sure, if you have children, you thought for months about what to name him/her. Although traditional naming patterns are rare these days, we still name our offspring something important to us. We want them to be a member of our tribe, or we want to honor and remember someone special who has gone before us. Our ancestors were no different. Even if they did not subscribe to the traditional naming patterns of their heritage, they still choose meaningful names for their children. Often that meaning is obscured behind the veil of time, and we are left speculating on the meaning and origin when there is no direct correlation. I have a lot of Harrison's, Lloyd's and Anson's in my direct Faulkner line. Even more collaterally. The name Harrison, especially has been used across numerous branches of the Faulkner descendants, but I'm as yet unaware as to the origin. I have been trying to identify the purportedly eleven children of my 3rd great grandfather, James Faulkner. He was said to have eight daughters and three sons. I can only get to nine. I am missing a son and a daughter. The other bit of information that bugs me is a man named Nelson Faulkner who purchased land adjacent to James, my 3rd great grandfather, in the Michigan Territory in the 1830's. Nelson seems to appear out of nowhere. And vanishes just as quickly. I have been trying to claim him as the missing third son for some time now. The Michigan patent, dated 1837, says that he is from Michigan, whereas James Faulkner's patent, dated 1834, says he is from New York. That's true. He was an early settler in Jackson Co, by way of Orange Co, NY. Clue #2 would be the land patent. Although vague it does put Nelson as a resident of Jackson Co, Michigan in 1837. Whereas James and his family settled in Grass Lake (Jackson Co) in 1834. Meaning by 1837 Nelson would be a resident of MI if he had come with his family in 1834. Clue #3 just sort of "hit" me when I was not paying attention. (Here it comes!) While relooking at the names of my 2nd great grandfather's children recently, it sort of slapped me upside the head. IF Nelson was a son of James, then Harrison, my 2nd great grandfather, would be his brother. Harrison's known brother was named Anson. Harrison and his wife had three sons. Arthur Edward, Lloyd Anson, Louis Nelson. Coincidence? Maybe. Edward was the name of his wife's father. Anson, of course, was his brother. So, Nelson was .... ? I still have some digging to do, but I feel just that much more confident that Nelson could actually be the missing third son. Have you considered the names of your ancestors and their collateral family? What's in a name could be more than it first appears. When stuck, perhaps a reexamination of family names may afford a clue. Just maybe you will find another piece of your puzzle!